my guide to madewell denim. Last Summer, I went into a Madewell store when I was visiting Portland with a friend of mine. I had heard of the brand, but for some reason, I never really thought it was my style. Well, I couldn't have been more wrong as I walked out of the store with three things and longing for more! A few months later, I was longing for some new denim and had been really wanting to try high-waisted but couldn't find a pair that didn't cut me off in the most unflattering place. Insert, the Madewell 9 inch high rise denim...life changing! They have SO much stretch and are so insanely flattering, holding in all the areas of our midsection that most of us hate (especially after having a baby). This hi-rise denim comes in 9 or 10 inch and all different variations and washes. 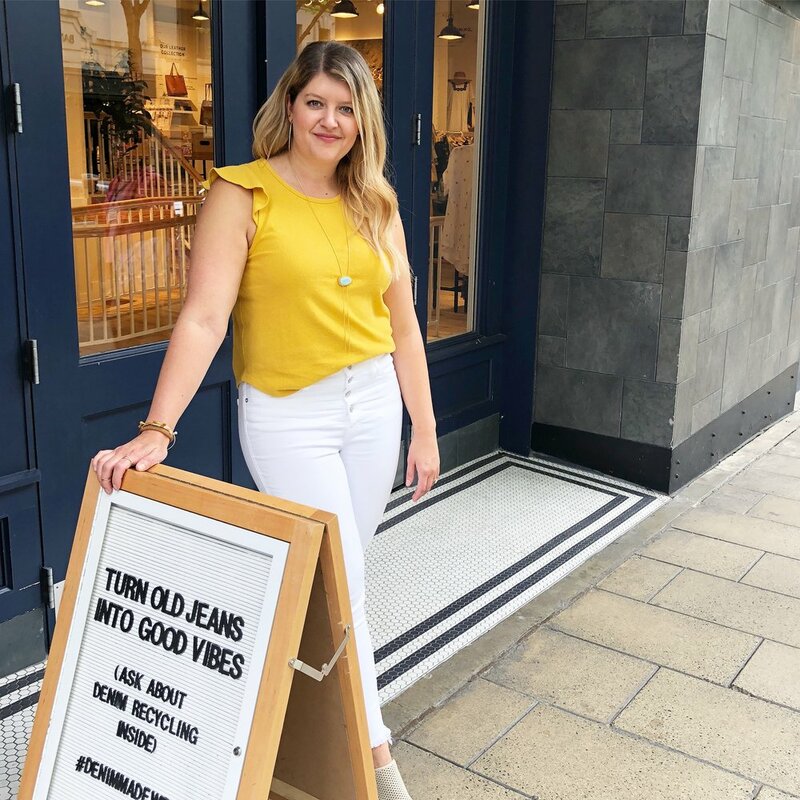 I was lucky enough to host an event at my local Seattle Madewell store and got to try on almost every pair of denim that I didn't own yet, and out of all of them, there was maybe only one or two that didn't work with my body type. As an added bonus, Madewell will also give you $20 off any new purchase of denim when you bring in an old pair to donate (I couldn't believe I didn't know about this sooner - you can find out more about that here). I have recently slowly converted all my denim to Madewell and I think I just purchased my fifth pair with these amazing button fly shorts. 1. THE BEST SHORTS: these are so flattering, fit true to size and just have the right amount of stretch. I prefer the button fly, but the regular zip fits just as great - the hudson runs a tad small so size up one. The others have ton of stretch and run true to size. 2. THE BEST WHITE DENIM: I know what you're thinking...white denim will not look good on me...but these will! I have the button fly and I'm obsessed with them - they also have a ton of stretch so size down one. The non-button fly fits true to size. 3. THE BEST BOYFRIEND JEAN: finally a BF jean that has some stretch! This style is usually so structured and stiff, but these actually move with you! 4. THE BEST HIGH-RISE BASIC: these are all fabulous and fit every body type! They even have tall and curvy versions! They all fit true to size and do have a bit of stretch so size down one if you're in between. best of april & may 2018.